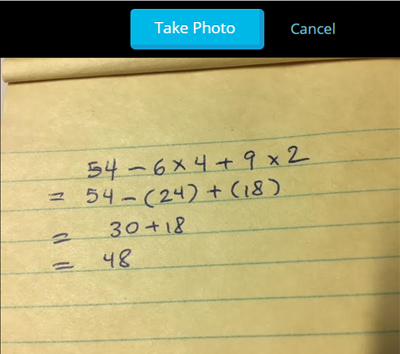 During Missions and GameShows, you can now upload a solution using your webcam on a Chromebook, laptop, or desktop computer. When a student clicks Show Your Work, if they have a working webcam, they will see a choice of options. Select Use Webcam. Though if you'd like to upload an existing file on the computer, press upload a file. 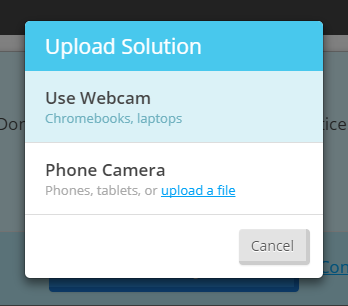 Your webcam will now be activated and you can position the solution in front of it. The image will initially be mirrored (webcams do this for "selfies"), but after you press Take Photo, it will be un-mirrored. Then press Accept to use this image, or Retry to try again.